The photos Prakash Raj tweeted are years old and from different places. USA unit of Shiromani Akali Dal (Amritsar) staged protest against Modi outside UNO office in New York. Modi was here to address a gathering at a seminar. The protesters under the patronage of S. Surjit Singh Kalhar (President, Shiromani Akali Dal (USA)) and Spokesperson S. Sarabjit Singh New York shouted pro-Khalistan and anti-Modi slogans on this occasion. The protesters termed Modi as ‘Hitler of India’ in their slogans. NEW DELHI (Reuters) – Protesters clashed with police on Wednesday outside the University of Delhi, where Gujarat Chief Minister Narendra Modi, a popular but divisive contender to run for prime minister within a year, was making a speech to cheering students. LONDON, UK—Federation of Sikh Organisations (FSO), based in the UK, sternly asks for masked protestors to stay away. FSOUK has asked any youth planning to participate in the #ModiNotWalcome demonstrations to be held in London on Thursday 12th November, outside Downing St and in Parliament Square to behave themselves. General Secretary of the FSO, Bhai Kuldeep Singh Chaheru asked the more youthful members of the congregation to keep themselves respectful and should an “elder asks them to refrain from certain behavior, listen and refrain”. Continuing, he asked “Anyone who plans to cover their face with scarfs or obscure their faces by other means for concealing their identity, to not participate at all”. To anybody wishing to participate peacefully and resectfully, he said he welcomed one and all. 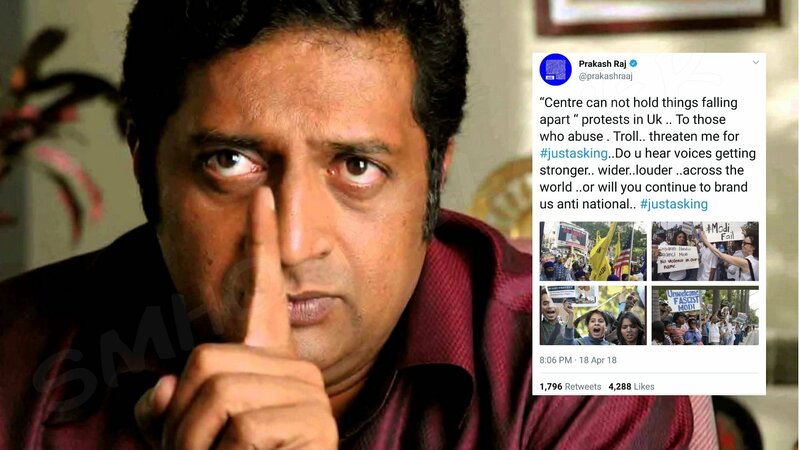 Actor Prakash Raj tweets wrong photos to prove his point ! ← Neither is he a BJP leader nor was it about any 10 year old girl. Udtaa Manipur ? Nope. this is an island in Alaska. Did Brett Lee along with his wife convert to Hinduism ? Fellas, don’t run for Visa to Iceland yet.